Sixteen operators will have their top skills on show mid-November as they compete in the MIMICO Excavator Competition, which is being held at The Truck & Machinery Show in Kumeu. The competition is a standalone one-day, one-winner event that will see operators participate in eight activities designed to find the best from a good bunch. Course manager Brook Harland of Burnetts Transport and Earthmoving has been tasked with providing an event that has been designed to keep spectators entertained while requiring competitors to summon their best skills. "Some of the activities will be straightforward," Brook says. "We’ve got a log crossing, some confined spaces, a Waratah fence to erect along with a bunch of building cores to stack up." Other activities include placing a tyre on a totem pole and manoeuvring a frame around a length of a pipe. To make things more interesting, competitors will be required to keep a ball in play, which will involve sending it through six hoops placed along the course before finally dunking it, basketball-style. 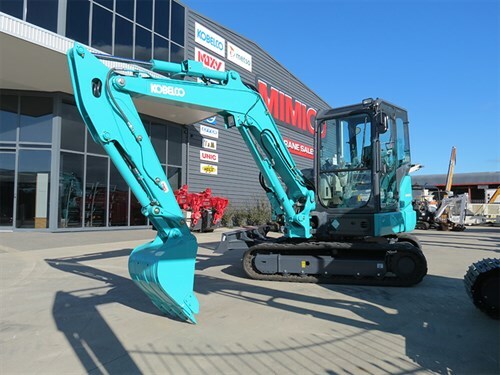 Main event sponsor MIMICO will be supplying a 13-tonne Kobelco SK135SRLC-3 for a static pre-check stage, and two 5.5-tonne Kobelco SK55SRX-6 excavators for the main competition. "We’ll basically be duplicating the course so two machines can work at the same time," Brook says. "This way we can move through the competitors quickly, and it will be interesting for spectators." MIMICO representative for Northland and Auckland, Chris Skelton, says the company was keen to get behind the event. "One of our customers ran it by us, and we thought it was an excellent idea," Chris says. "Our managing director gave us the go-ahead immediately, as the competition falls directly within the people we engage with, and as no show such as The Truck & Machinery Show has been held in the Auckland region for some time, we thought support for the event was essential." Show organisers Amy Glynan and Karen Black are also enthusiastic about the event. people working to get everything together," Amy says. really strong response to it and now have a waiting list." The MIMICO Excavator Competition will be held at The Truck & Machinery Show on 18 November 2017 at the Kumeu Showgrounds, Auckland. For more information, visit truckshow.co.nz. We chat with NZ Wheelbarrows at the 2017 Auckland Build Expo about their electric wheelbarrow.